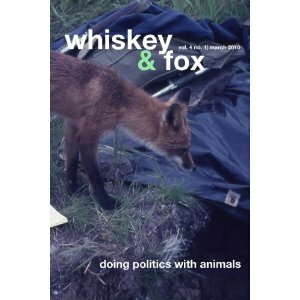 It has been a long hibernation, more than a year, since anyone has heard any dispatch from Whiskey & Fox. It just took a long time to get the new format, the new editorial collective, and the whole new phase in the life of the journal, all up and running. But, as of today, the hibernation is over. The fox is up and about. Below, are, as we have promised, two PDF's for free distribution: first, the 'electronic' copy, a PDF of individual pages suitable for reading on one's computer screen or printing as you wish--especially if you must print one-sided; second, a BOOKLET printing copy, in a file already set up for booklet-printing if you, like us, are committed to the remaining possibilities of a book or book-like object. Simply print double-sided, with pages oriented for 'short edge' binding, and then fold the whole thing in half into a book (staple, if you wish). The thing is, that since this issue weighs in at almost 40 pages, we thought it might be nice for Whiskey & Fox to be available in yet another format--one a little bit more durable, and fancy. So this issue is going to be, very soon, available for purchase as a perfect-bound book through Amazon. The book is print-on-demand, and promises to look pretty nice. Check back here soon if you love the book-object. We'll announce it as soon as they are available. This issue's title as a call for work garnered a whole pile of submissions. Thanks to all who have sought fit to send us work. Keep checking back here, now that things are up and running, for more consistent updates. The fox is awake, and hopefully within the month we'll have info on the title of and calls for work for at least the next issue--which we'd like to see out by end of spring/summer depending on how the work goes. A Preface from the editors, and work (in order of appearance) from Robin Clarke, Jeff T. Johnson, Ross Gay, Gary Lehmann, Claire Donato, Rebecca Mertz, Nicola Masciandaro, Eileen A. Joy, Chris Miller, and Afterwords from Karl Steel. Special thanks are due to Matt Lee and Meagan Manas, for their unique although otherwise hidden contributions to the issue. And remember, perfect bound copies available soon.